I’m never really that bothered about pancake day. When I was younger,I used to take part in lent (of my own accord) and gave up chocolate, crisps, bad language etc… but over the past couple of years I’ve not really felt like I should give anything up (and there’s no way I’m giving up Netflix any time soon!!). I went to Pudding Pantry! If you know me, you know that I love Pudding Pantry and have done for the last couple of years, ever since I had their bacon and maple syrup pancakes and granola I have fallen in love with the decor of the place and their cakes (even the vegan ones!). So I saw that they were open late on Tuesday so me and my friend went to get the pancake specials they had on!! I had the Cinnamon Swirl pancakes because I love all things cinnamon-y and apple-ly, especially together, while my friend went for the Black Forest! And they were delicious! I promise there are pancakes underneath all the wonderfully sweet apple compote! 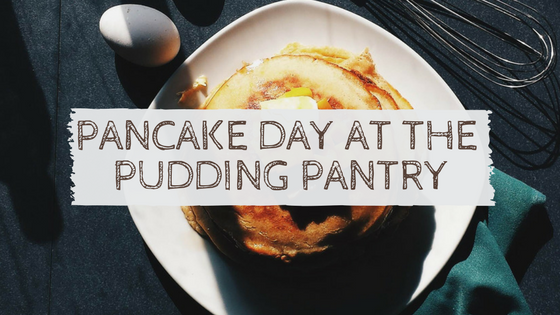 It also wasn’t as busy as I thought it would be, as no bookings were being taken but it was raining outside and by the time we ate it was twenty to seven – so most people would’ve already had their pancakes! But I can’t believe I haven’t been there for pancake day before, it was lovely and there was quick service! If you haven’t been there already, GO!! GO!! GO!! You’ll find it in Nottingham, just tucked away round the back of Corner House and Turtle Bay, opposite The Gym (Very strategic placing there! Especially because as a member you get discount for the pudding pantry!) and Cafe Nero. They are now open late on Thursdays, Fridays and Saturdays I believe – so more time to enjoy their lovely cakes! I would totally eat both of those pancakes! I love Apple and cinnamon but Black Forest and anything cherry holds a special place in my heart! Just about died reading this post! I frickin’ love the Pudding Pantry (I only discovered it last month and am totally obsessed with it now). The pancakes look amazing – you can never have too many. Oh they look yummy, I never have pancakes out but should do because they’re one of my favourites! I meant to get creative this year with ingredients at home but looked in the cupboards and couldn’t find anything! I tried to make a forrero rocher one which did not taste as good as it sounds!